We’d love your help. Let us know what’s wrong with this preview of Journal to the Self by Kathleen Adams. A nationally known therapist provides a powerful tool for better living--a step-by-step method to personal growth, creative expression, and career enhancement through journal writing. To ask other readers questions about Journal to the Self, please sign up. It was OK. The journaling ideas were fantastic. However, many of the stories and examples were extremely new-agey. If you are willing to call your journal your "blood brother" or sprit friend or whatever, then you will love this. If you are more plain & practical like me, you'll appreciate the tips while gritting your teeth at the fuzziness. я очень хочу заняться фрирайтингом и ведением дневника (нескольких дневников) на постоянной основе и регулярно ищу вдохновение в книгах. фрирайтинг отлично разгружает голову и лечит панические атаки (у меня). эта книга вроде бы норм, но примеры из жизни крайне негативные. я понимаю, что это как раз те ситуации из которых дневник помогает выбраться, но читать тяжело. очень понравилась тема со списками 100 целей, 100 причин. What I learned from this book is that there are no rules when it comes to personal journal writing. This one aspect has made the idea of keeping my own journal less daunting. A good book for beginning journalers... it lists some guidelines for keeping a journal, a list of items one may want to collect for their jounal tool box, and a series of ideas/exercises to get the writing flowing. I'm still in the beginning phases of my own journal, but I can't wait to try some of the Lists of 100 as well as What I learned from this book is that there are no rules when it comes to personal journal writing. This one aspect has made the idea of keeping my own journal less daunting. I'm still in the beginning phases of my own journal, but I can't wait to try some of the Lists of 100 as well as some of the other prompts/exercises she talks about. A staple. An absolute must for anyone who already journals or likes to journal. Do you usually journal by simply putting on paper whatever comes to mind at the moment? Read this book. I kept a journal since I was a teenager but at some point I stopped. Perhaps, I decided that living my life takes too much time and I have no time to write about it. I have come to regret this decision recently and I came back to journaling. The beginning of this book made me long for keeping a journal again - and th A staple. An absolute must for anyone who already journals or likes to journal. I kept a journal since I was a teenager but at some point I stopped. Perhaps, I decided that living my life takes too much time and I have no time to write about it. I have come to regret this decision recently and I came back to journaling. The beginning of this book made me long for keeping a journal again - and the author described picking out a journal so lovingly that I found myself running out to a bookstore (mind me, in a foreign country!) to purchase one. The rest of the book is a writing shop. Pick out the interesting technique of writing or even a journaling project that could last for two weeks minimum and go! The instructions are clear and complete with ore-writing meditations for those of us who need to concentrate a little bit before starting to write. I personally use the techniques sparingly, coming to them spontaneously when I feel that I need them - but if I didn't know about them how would I be able to? A nice guidebook for aspiring and novice journal writers, especially in the context of exploring one's inner thoughts through the process of writing journals. Tad slow at times. But a good guide overall. Неплохая книга с советами по ведению личного дневника - фокус на психотерапевтию, но есть идеи и для других целей, в том числе бизнеса. A simple text, but I think a classic. When I give journal workshops at my local library, this is the main text I use to gather up potential exercises (and they're all fun!) I've also had Kathleen Adams as a teacher in grad school and she's a beautiful human being. It was perhaps one of the most fulfilling cycles in my life when I was consistently working with her coursework, which included the workbook version of this text. I bought and read this book with so much pleasure I made it a part of my permanent library. It is still there, on my shelf, and I refer to it often. If I had to chooe between this or her other book The Way of the Journal I would say read this one! However, don't hesitate to buy both because they are a perfect complement to one another. Invaluable to anyone who takes their journaling seriously or who maybe needs to infuse their journaling with something new. When I first bought this, about 10 years ago, I disliked enough I leant it to someone and didn't see it for years. Having just got this back, now I appreciate it. There's a lot of specific techniques for introspective journaling. Strangely, what worked for me was the suggestion for 'Time Capsule' journaling - a basic and straightforward account of our day to day lives - in addition to more emotional and thoughtful work. A useful book I will return to again. As someone with an ever-growing interest in and love for journaling, I really liked this book. I would definitely recommend it to anyone looking to further their connections with themselves or even just gain a new perspective on journaling and to see what it can do for a person. I re-read this book every once in a while to give my journal a boost. Simple and straight-forward, lots of ideas to get you pen moving. This was one of those impulse reads. Saw it added to a friend's to read list and somehow ended up reading it immediately. Given the new age title, not sure what I was expecting. Sounded self help + new age and that is what it delivered. It sure provides interesting ideas of what one can try when journaling, but all the fluff around it was bothering me. I already mentioned the new age flavor of it. In addition, there wasn't always a clear structure, or clear reasoning, or examples. The latter were This was one of those impulse reads. Saw it added to a friend's to read list and somehow ended up reading it immediately. Given the new age title, not sure what I was expecting. Sounded self help + new age and that is what it delivered. It sure provides interesting ideas of what one can try when journaling, but all the fluff around it was bothering me. I already mentioned the new age flavor of it. In addition, there wasn't always a clear structure, or clear reasoning, or examples. The latter were an especially confusing bit. Some of them did the job of illustrating the point, but some absolutely didn't. Some looked oversimplified and some were way too long and convoluted. I do understand the reasoning for using real journal entries from real people and I'm sure all of them were used with permission, yet I couldn't stop feeling creepy. Finally, I simply cannot take anyone seriously after they use the left-brain right-brain nonsense as a fact. Distortion of scientific findings is a pet peeve of mine and this particular one has been and still is so pervasive I sometimes want to scream. This was published in 1990 so don't be surprised if it is quite outdated. Psychology and psychotherapy have traveled far and wide in the last quarter century, "us baby boomers" doesn't apply to a lot of "us" anymore, and while many people still love the feel of writing on paper electronic journaling has its fans and advantages. This is the perfect book to read if you want to know every nook and cranny there is to writing a journal. It tells you all the personal and emotional benefits to writing a journal, the different methodologies of journaling, and how journaling can be incorporated/partnered into other creative avenues such as creative writing and art. This book is so incredibly thorough in explaining all the aspects of journaling that it truly serves as the best reference book if one wanted to do research and write a paper on the topic. Within the pages, one will also find various prompts as well as different creative ways to journal, and you don’t have to stick to just one. Actually, the author recommends trying a few, if not all, in order to get the most of what you can through journaling. I highly suggest this book to anyone who keeps a journal. It has some very interesting and fun ideas to try out and is quite informative. I mostly expected Journal to the Self to be full of platitudes about how great and inspiring journal writing is. I would agree with that sentiment so I thought I'd read it to get me motivated to pick up my own notebook again. However, I found many practical techniques that I've already put to good use alongside all my newly found inspiration and motivation. There are quite a few anecdotes too and sometimes I wasn't sure if it was the writer or a guest / journaling-course-past-studen I loved this. Хорошая книжка о том, как вести дневник с возможными упражнениями. Не знаю, воспользуюсь ли я ими, но было полезно и я начал снова писать дневник, что тоже неплохо. Самое главное правило - никаких правил, а потом разберусь, что к чему и, возможно, вернусь к ней. 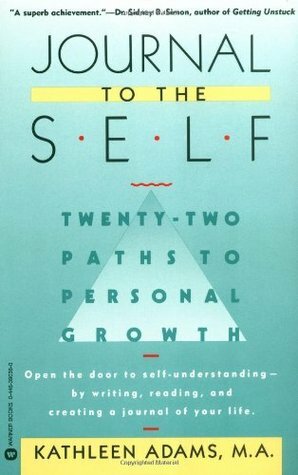 This books gives some good techniques for learning about yourself while writing. If you have a problem with overly spiritual readings, then you may not enjoy this as much. Завтра же куплю себе очередную дневниковую тетрадь! The best book on journaling I've ever read! I'd never realised there are so many different ways of journaling! Makes a lot of sense. I was able to glean a few good ideas, but the book is quite dated and geared more toward journaling as a therapeutic tool than anything else. Pros and cons. This is an older book and comes across as pretty dated. But does writing advice ever go out of style? As a longtime journal-er and notebook-keeper, I appreciated the chapters featuring techniques and examples of each. I owe this writer a lot of thanks. I taught freshman English for twenty years. During that time, my students were required to keep journals. I shared many techniques with them, and many of of those techniques I took from this book. Rereading it as a retired English teacher with just my own personal journal keep, I discovered techniques I had forgotten about. The book written in 1990 is a bit old fashioned; there are no chapters on keeping an online journal or even using your iPod to update the j I owe this writer a lot of thanks. I taught freshman English for twenty years. During that time, my students were required to keep journals. I shared many techniques with them, and many of of those techniques I took from this book. Rereading it as a retired English teacher with just my own personal journal keep, I discovered techniques I had forgotten about. The book written in 1990 is a bit old fashioned; there are no chapters on keeping an online journal or even using your iPod to update the journal. Still it was a very good reread. I know why I kept this book. I know why I taught many of the techniques. I often recommend this book to people I know. It has some anecdotes and points of reference that I don't relate to but I don't find that a problem. It's practical, easy to use, motivating, has a great variety of ideas and gives approaches for when you have little time as well as for when you can spend longer on journalling. She credits a lot to Ira Progoff's journaling course which prompted me to get his book. Unfortunately I found that unreadable, so I'm glad that Kathleen Adams has translated I often recommend this book to people I know. It has some anecdotes and points of reference that I don't relate to but I don't find that a problem. It's practical, easy to use, motivating, has a great variety of ideas and gives approaches for when you have little time as well as for when you can spend longer on journalling. As my children grew from preschoolers to high schoolers, entries to my childhood diary increased while my responses to writing prompts became more and more sporadic; those one-line prompts didn't always strike the right chord to get my creative juices flowing. I started to rethink “journaling” and how I spent my writing time, and turned to these books for guidance. The IT book for journaling for your life! It has common-sense suggestions to how to start journaling. It offers options (type of journal, pens, topics, routine, etc) along the way in every chapter. so the readers choose what resonates the most. The content flowed with my experience of journaling for many years. I would love to follow some of its creative exercises. Rated 4 because the print is very old & small size text. Kathleen (Kay) Adams LPC is a best-selling author, speaker, psychotherapist and visionary. Her first book, Journal to the Self, is a classic that has helped define the field of journal therapy. She has also written The Write Way to Wellness: A Workbook for Healing and Change, The Way of the Journal , Mightier Than the Sword , and Scribing the Soul. Kay is a beloved teacher whose innovative work has Kathleen (Kay) Adams LPC is a best-selling author, speaker, psychotherapist and visionary. Her first book, Journal to the Self, is a classic that has helped define the field of journal therapy. Kay is a beloved teacher whose innovative work has helped hundreds of thousands of people heal, change and grow. Her dynamic presentation style is fluid, clinically grounded, intuitive and engaging. She is the voice of journal therapy at conferences, hospitals, mental health agencies and seminars around the world. A tireless advocate for the healing power of writing, Kay is a three-time recipient of the National Association for Poetry Therapy’s Distinguished Service Award. She was a finalist for the first Season for Nonviolence Peacemaker Award in Colorado for her work bringing journal therapy to populations as diverse as people with HIV/AIDS, breast cancer survivors, recovering addicts, and survivors of violent crime. In an About.com poll, Kathleen Adams was listed (with Anais Nin and Anne Frank) as one of the three most significant influences on contemporary journal keeping. With more than 40,000 clinical hours in the field, Kathleen Adams is among the most experienced and respected journal therapists working today.